Compact and portable, the V-1SDI delivers professional switching results with its easy to use hardware interface complete with T-Fader and easy-to-see backlit buttons. With support for 3G-SDI, the V-1SDI can operate at full 1080p resolution and can take advantage of the longer cable distance of SDI making this compact solution suitable for events and applications in even large spaces with the most professional level of SDI camera sources. Input 4’s scaler now supports a wider range of video and VESA resolutions. The V-1SDI has two dedicated 3G SDI inputs, a third channel input that supports 3G SDI or HDMI and a fourth channel HDMI input that also includes scaling. This makes the V-1SDI ideal in a variety of configurations for both an all camera applications and applications that mix cameras, video sources and computer data sources. The V-1SDI includes DSK (Downstream Keying), Picture-in-Picture (PinP), Split and Quad composting effects ideal for creating news style broadcasts and corporate presentation content. The DSK function is great for overlaying titles, song lyrics or logos onto incoming video sources that can be switched in the background while text or images remain displayed. The DSK supports both Luminance Keying (Black / White) and Chroma Keying (Blue / Green). 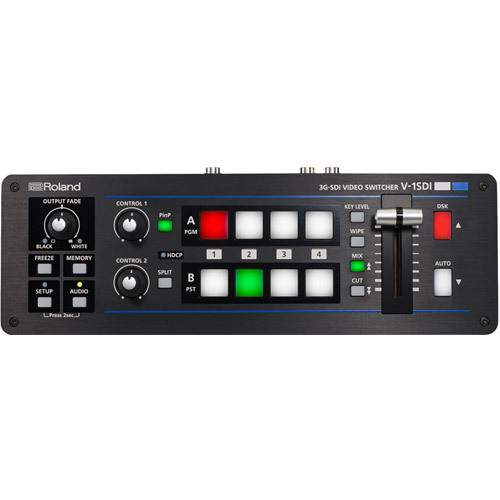 The V-1SDI can mix 5 stereo audio inputs from the SDI or HDMI ports, the stereo line level input and a mic level input. Every audio input is equipped with a DELAY function* to synchronize the video and the audio as well as EQ for adjustment of sound quality. Audio output is equipped with a MASTERING function to improve the sound of the final audio mix. 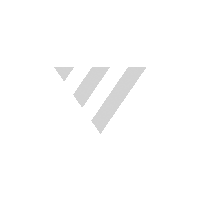 Audio follow function enables the audio to transition along with the video. The final audio mix is both embedded in the SDI and HDMI output along with the video signal and is also output to the stereo audio output jacks for sending the audio mix to a PA system or recording it on an external device. 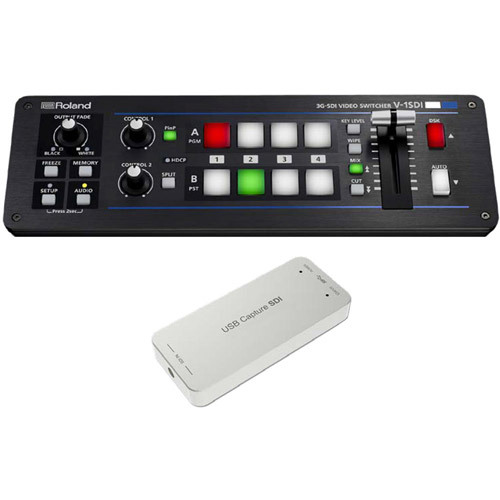 Remote control is possible with the V-1SDI RCS dedicated computer software for Mac and PC connected via a USB cable.The application offers a detailed view of the connected V-1SDI and can be used to switch video, mix audio or change settings. *INPUT 3: SDI or HDMI selected.